Pure Formulas is a catalog and online retailer of health supplements and vitamins, based out of Miami Florida, United States. Although you can visit its facility, orders are almost exclusively made through PureFormulas.com, or by phone at 1-800-383-6008, and the mail order catalog. They run many offers and deals so you can make savings, and these are redeemed with special Pure Formulas coupons. We keep an up to date list of these here at Coupofy, so you never have to waste time searching elsewhere. The privately held company is relatively new to the marketplace, launching in 2010 at the behest of current CEO José Prendes. They are estimated to make under $1 million in yearly revenue, with the majority of sales coming from return customers. What sets them apart from the competition is their commitment to free shipping and free returns on all orders. Pure Formulas stocks thousands of individual supplements, vitamins and superfood formulas, covering all areas of health and wellness. You can browse the site via its categories, the search bar (which allows you to enter a keyword or catalog item number), or you can shop by brand. Product listings can also be refined by a number of parameters. Their selection covers Vitamins, Minerals, Cardio Support, Men's & Women's Health, Weight Control, Digestive Support, Fatty Acids, Nervous System Support, Hair Health, Allergy Remedies, Oral Health, Fitness, Immune Boosters, Amino Acids, Bone & Joint Support, Sexual Wellness, Skincare, Nail Care, Protein & Bodybuilding, Homeopathy, Anti-Inflammation, Blood Health, Hormone Regulation, Detoxification, Ear & Hearing, Liver Support, |Energy Boosters, and much more. 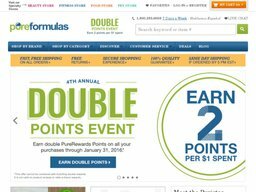 Depending on what's available at the time your Pure Formulas coupon code may be applicable on all products or specific products only. 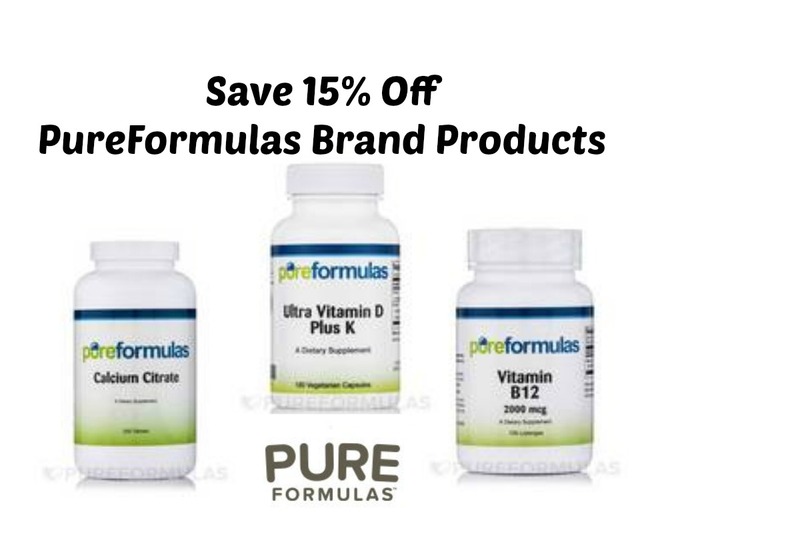 Pure Formulas stock a wide variety of well known and lesser known brands. Some of the most popular include Pure encapsulations, Metagenics, Thorne Research, Douglas Laboratories, Designs For Health, Integrative Therapeutics, OMP, Kirkman, Vital Nutrients, Alvera, American Biologics, Nature's Way, Living Intentions, Garden of Life, Ultimate Superfoods, and hundreds of others. Visiting the brands page will give you a full A to Z list of the brands they sell. There is also a specialized sub-site within PureFormulas.com that caters exclusively to pet health, with hundreds of over the counter medicines, health products and food products. They serve Dogs, Cats, Birds, Fish, Horses, Rabbits, and others. Pure Formulas accepts payments made with major credit cards, including Visa, Mastercard, American Express, Discover, Diners Club, JCB, BC and Union Pay. Alternatively, customers who have a PayPal account can also make their payment via PayPal. There is special promo box before the online payment page where you can enter a Pure Formulas coupon code to redeem the corresponding offer. PureFormulas.com is committed to free shipping, allowing all US customers to have their orders (regardless of size) delivered within 7 days by the US Postal Service or UPS. You don't even need to use a Pure Formulas coupon. You can also pay for faster methods, such as 5 days for $3.99, 3 Day for $6.99, 2 Day for $9.99, and Next Day for $24.99. They cover all 48 contiguous states, as well as Alaska, Guam, Hawaii, Puerto Rico, U.S. Virgin Islands, and APO & FPO addresses. International shipping is also available, though you should add items to your basket and enter a delivery address to calculate the cost and estimated delivery time. PureFormulas guarantees satisfaction for each of its customers and strives hard to deliver high standards. Just in case, the item doesn’t meet your expectations, you can request a refund or opt for a replacement. The return request has to be made within 30 days from the date of purchase. No restocking fee is charged and you don’t have to cover the shipping either. The amount is refunded back in the same way or the method you used to pay for that particular item. However, it’s your responsibility to send back the item in saleable condition. First of all, you need to get a print out of the return label from your account’s “Order History” section and then attach it to the package that needs to be shipped back.